We teamed up with Kohler in hot pursuit of a common enemy—the water hog—and we asked you to submit your water-saving solutions for a “Water Wise” future. The submissions flooded in (pun intended) and our team of judges have finished wading through the entries. We are pleased to announce the following winning submissions. Join us in congratulating George Sacaris for his entry, Circe Series. Description: "In Greek mythology Circe is a minor goddess of magic who transformed her adversaries into pigs. In the case of this design her mission is to transform all that come into her gaze into 'Bath Hogs'... responsible 'Bath Hogs' at least. 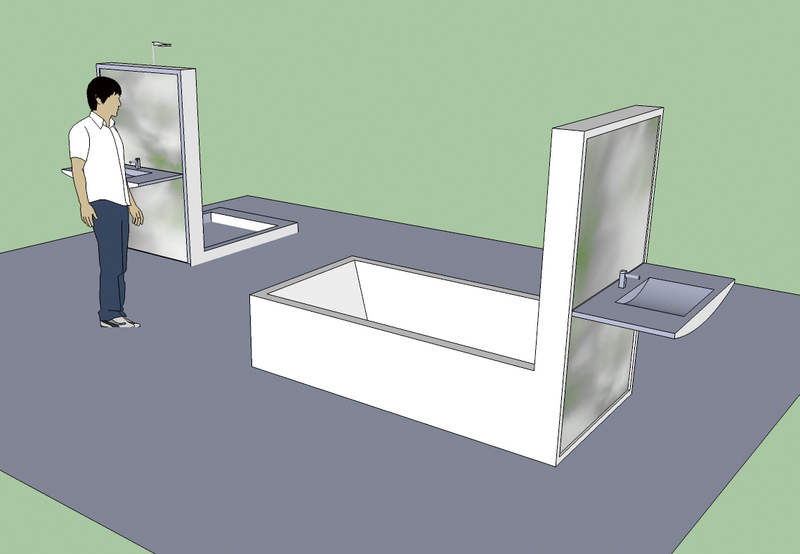 My idea is to create a totally self contained bathtub/ sink unit and a shower/ sink unit that are capable of collecting, purifying, re-heating, and re-using the same water over and over. I see the overall materials as being cast porcelain and removable mirror panels covering the equipment. Within the thickness of the vertical element would be contained an instantaneous water heater and an instantaneous filtering system. Gray water would be pre-filtered and stored in tanks under the floor. These fixtures conserve water without guilt or sacrifice... a 'Bath Hogs' dream." Two honorable mentions go to J. Michael Kilpatrick for his entry Know Your Usage and Jake Bjeldanes and Tim Daw for their combined effort in Aquantify. Description: "Sometimes, to conserve water, one just needs to know how much they use. Immediate information allows us to make more concise judgments of our water usage and encourages us to just turn it off. This proposed system allows individuals to follow their individual water consumption as they use it. It is composed of a key pad connected to electric water valves at every water faucet. These components are tied into a computer with a program that records the hot and cold water used. Each user has an assigned number and they key in their number whenever the need to turn on the water. The amount of water displays at the key pad in real time. This method is suited to big households, dormitories, fraternities, and sororities to ferret out the worst water hogs amongst us." Description: "How much water do you use to take a shower?Most people are too busy planning the day ahead to think about water conservation. The Aquantify shower head takes out the guesswork, displaying the exact volume of water used on its easy-to-read dial. It encourages daily conservation by reminding users of their own personal footprints. There are no complex systems to learn and it’s as easy to read as a clock." To see more of our favorite entries, check out this slideshow.